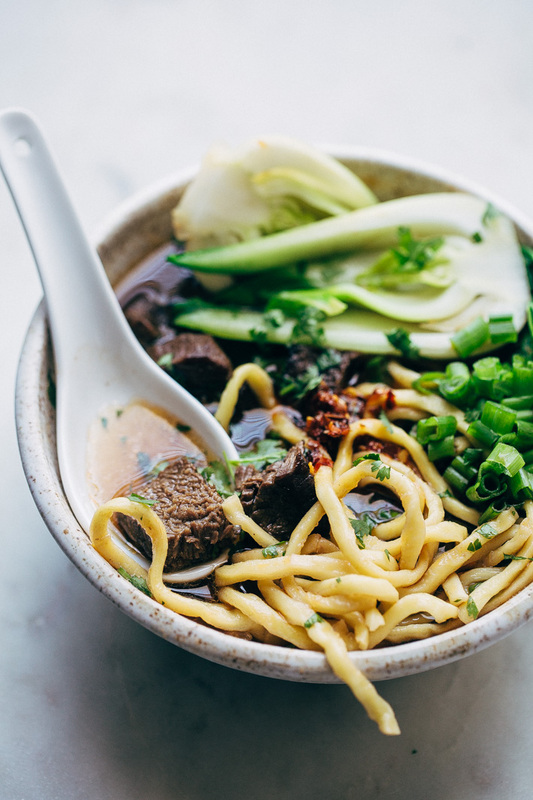 Cozy Taiwanese beef noodle soup that has been slow simmered with tons of aromatics to let all those flavors really develop. Put a large pot on this weekend and enjoy the comfiest soup for dinner! 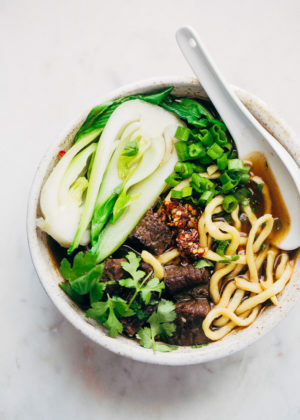 Slow simmered beef broth with aromatics, spices, like star anise and fennel, thick and chewy noodles, tender baby bok choy, and medallions beef that are cooked to the point where they just start falling apart. We’ll topping it all off with a generous sprinkle of scallions, a dollop of hot chili oil if you’re into that sort of thing, and slurp it all up with one of those large porcelain spoons that were invented for the sole purpose of slurping. It’s soothing as it goes down with just a baby kick of heat at the end. You can tell it’s been slow simmered from the moment it touches your lips. The aromatics warm all your scenes. It’s a big fuzzy blanket for your soul. Food magic that’s 1000% addicting. This ladies and gentlemen is that soup. You know the one i’m ALWAYS going on and on about from my favorite restaurant in chinatown. The one i’m embarrassed to recount how many times has been consumed. It’s such an addiction that it’s a standing item on our order from now until forever. If we’re going to Uyghur Bistro, this soup is happening without a doubt, every single time. And now that i’ve [finally] cracked it, my beloved beef noodle soup is going to be enjoyed in between those trips to our favorite restaurant, which for a while was somewhere in the ballpark of once a week. Shh. Forget I said that, we’re not getting into such things. I usually like to reserve these sort of, more involved recipes towards the end of the week because we like to do more quick and easy dinners weeknights around here but friends. Don’t be intimidated by this recipe. I can honestly say, I was terrified enough for the both of us and i’m coming out of it and telling you this one is NOT hard. It just requires some slow simmering so save it for the weekend and enjoy it with a good flick on in the background while you slurp up these noodles. 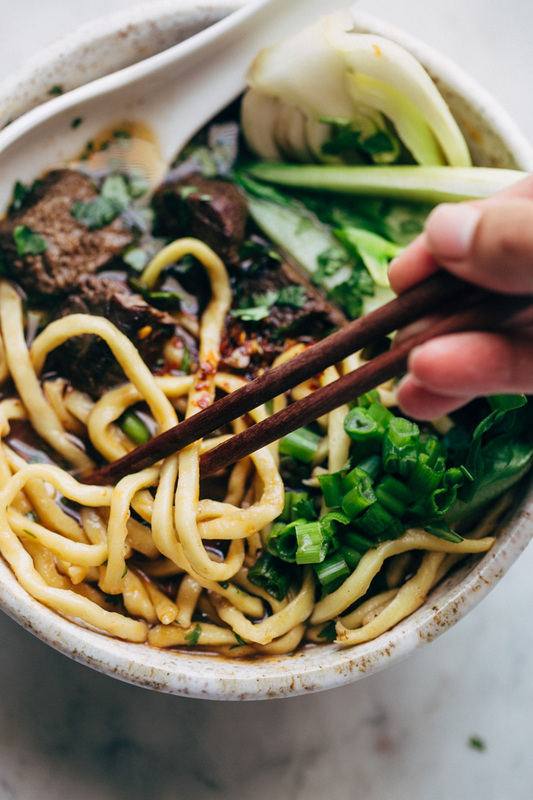 If you are into rich flavored broth, meaty, noodle slurping situations, let me be your beef noodle soup guide and assure you this one is for the forever files. I need to apologize to you right now because once you make this, they will be asking for it all the time. So i’m sorry but hey, at least theres big bowls of hearty beef noodle soup in your future. Gah this soup makes me loopy. Before we get into this recipe I want to say I make no claims of authenticity. This beef noodle soup is simply based off of one version of the soup, what was visually present in my bowl, and the tidbits of information I was able to gather (read: squeeze out) while questioning the staff on the sly. I’m pretty sure they’ve got a picture of me in the kitchen hunched over a bowl with the words ‘don’t answer her beef noodle soup enquiries’ written in all caps with a sharpie. Start with a couple glugs of oil and sear off the meat – you want to use something like brisket, boneless beef shank, or well-marbled beef chuck. Just something that can withstand the longer cooking time. You’ll need good quality beef stock – you can either make your own or start with store-bought. Make sure to use low sodium stock, I cannot stress this enough. We’ve got tons of soy sauce going into the mix so we need to make sure the soup base doesn’t end up being too salty. Ingredients! Okay, so this soup definitely has it’s lot of ingredients you may/may not be familiar with. We’re using spices like star anise , fennel seeds, sichuan peppercorns , and cloves. Noodles! You’ll need something on the thicker side. Hand stretched noodles are traditionally used but this is so not happening. I found these noodles at my local Asian mart in the freezer section, they said ‘Oriental noodles’ on the package and are made of wheat and came with those ramen-style seasoning packets. Only, these noodles taste nothing like ramen. They’re almost identical to the stuff our local restaurant serves, and they definitely make them in house. If you have no luck finding them, swap ’em for any THICK egg, wheat, or yakisoba noodles. Lo mein/yaka mein noodles that are fresh or dry are great if you can find them. You could even use spaghetti if that’s the only option you have. I simply cannot let you miss out on this soup just because you couldn’t find the noodles. For the veggies, i’ve got baby bok choy that i’ve just done a quick blanch on so they remain crisp. Swap them for baby spinach (no need to blanch) if you can’t find the bok choy. Garnishes are simple, just a bit of chopped scallion and cilantro. And that’s about it. I can sense the hesitation from the other side of the screen, but friends, I wouldn’t do you wrong. It’s seriously an amazing bowl of soup! 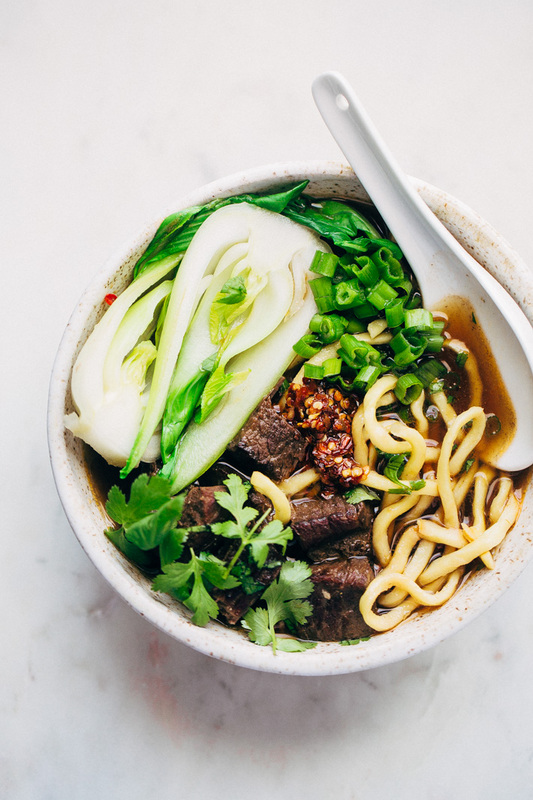 Cozy Taiwanese beef noodle soup that’s slow simmered with tons of aromatics to let all those flavors really develop. Put a large pot on this weekend and enjoy the comfiest soup for dinner! Heat the oil in a large stock pot or dutch oven over medium high heat. Brown the beef for 8-10 minutes, flipping as needed to brown all sides evenly. Depending on the size of your pot, you may need to do this in two or more batches. Do not overcrowd the pan, this will cause the meat to steam rather than brown. Transfer the beef to a plate. You should have about 2 tablespoons of oil/drippings left in the pot, remove anything more than that and discard. Add the ginger, garlic, onion, and scallions and stir them around until they they are fragrant and start to brown about 4-5 minutes. Add the brown sugar and tomato, let cook for an additional minute. Add the star anise, cloves, Sichuan pepper corns, fennel, beef stock, water, soy sauce, and beef. Allow the soup to come to a boil. Reduce the heat to a simmer and let cook for 30 minutes. You’ll want to skim the top for gunk. After 30 minutes, cover the pot and allow to cook for an addition 1 ½ – 2 hours. You’ll want to keep skimming about every 30 minutes or so. Remove the beef to a bowl. You can dice the beef into smaller pieces or leave them as is, totally your call. Strain the soup using a fine mesh strainer into another pot or a large serving bowl. 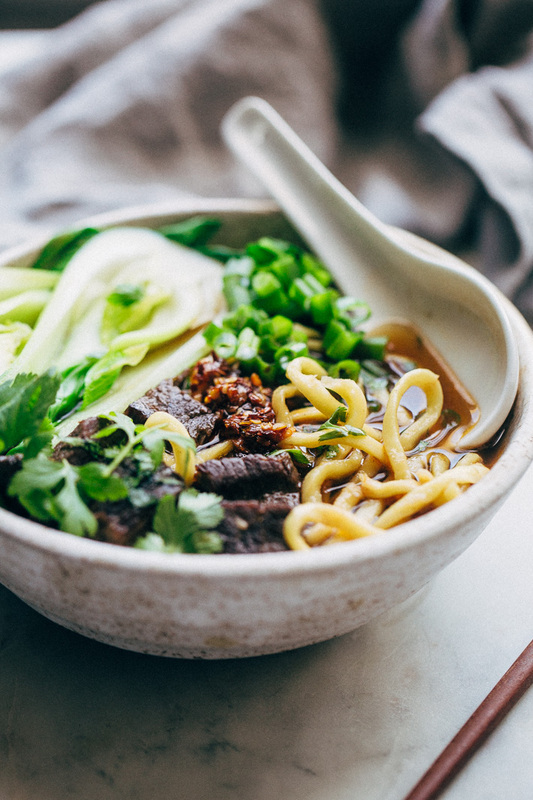 SERVE: Place about 2 ounces of cooked noodles in each bowl along with a few pieces of beef, baby bok choy, scallions, and cilantro. Drizzle with hot chili oil if desired. Soup can be prepared one day in advance before serving and refrigerated. The flavors actually intensify as it sits! Slightly adapted from Serious Eats .